Welcome to Markplex tutorial 97 in this collection of tutorials designed to help you learn TradeStation EasyLanguage programming skills. Please join our email list if you have not already done so and we will let you know when we release new tutorials or programs. 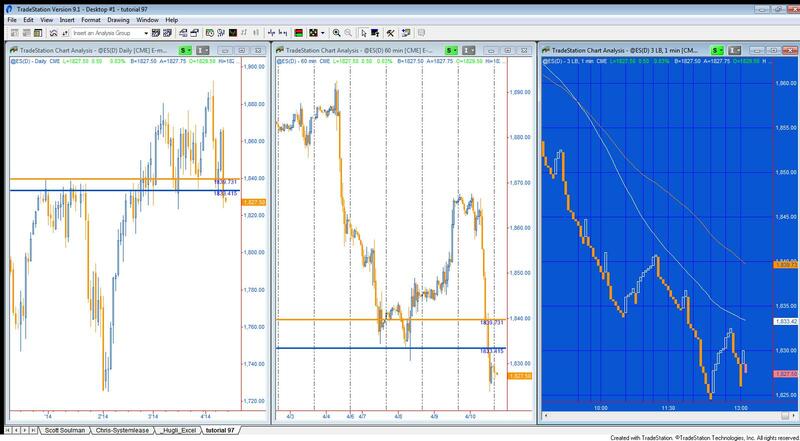 With program 35 (GlobalVariable.dll), when horizontal lines drawn on one chart are moved, lines on other charts relocate to the same levels. 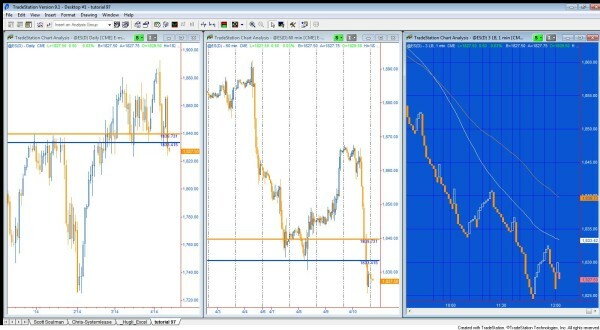 A Gold Pass member, who is using program 35, asked for a tutorial about how to develop a function, that could be used within an existing indicator, to pass real time information to another chart. 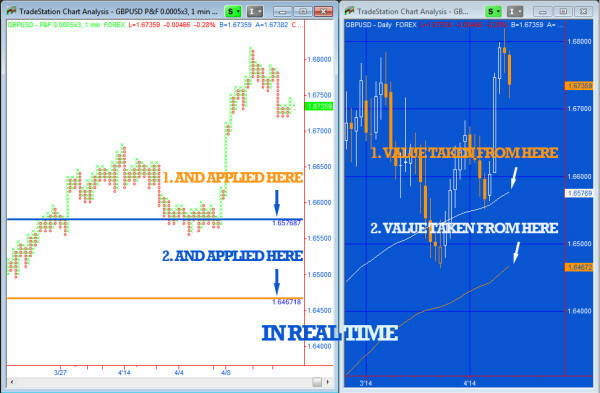 On the other chart those values would be displayed as horizontal lines. The tutorial 97 sending indicator is applied to the chart on the right. This indicator uses the tutorial 97 function which communicates with a show me study applied to the chart on the left. This can be achieved in several different ways. In this tutorial I use the GlobalVariable DLL. A function to enable two variables to be passed to the global variable (_Tutorial97). A showme study that draws two horizontal lines (and text labels) on another chart (_Tutorial97). A demonstration indicator that shows how to use the function ( _Tutorial97 Send). The workspace that I use in the video (tutorial 97.tsw). These programs are available immediate download for only $29.95. Import the ELD to install _Tutorial97 (a function), _Tutorial97 (a show me study), _Tutorial97 Send (an indicator) and associated GlobalVariable wrapper functions. Save the downloaded workspace and open it in TradeStation. where “Tut97” should be replaced with a unique string that should also be used on the receiving chart. Value1 and Value2 should be replaced with the variables you wish to share. The _Tutorial97 showme study should be applied to the “receiving” charts. The user input: UniqueName should be set to the same value was passed to the function. If you want to save yourself some typing, an unprotected version of the tutorial 96 indicator is available immediate download for only $29.95. The program will not work in MultiCharts.